This roomy and portable outdoor shelter is a great way to keep the rain or heat off and the bugs out. 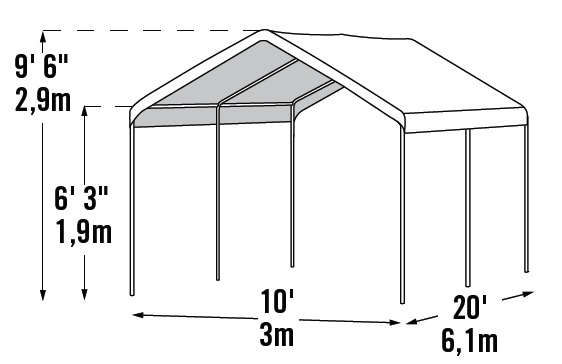 Strong enough to serve as a long-term shelter this 2-in-1 canopy shelter comes with a high grade 10' by 20' steel frame, a full valance fitted cover, a screen kit, SL bungee cords, foot plates, spike anchors, and easy step by step instructions. Expected to last for as long as ten years, this canopy shelter, by Shelter Logic, is totally tear resistant, UV treated, and 100% waterproof. Simply set this up and enjoy the outdoors in comfort. 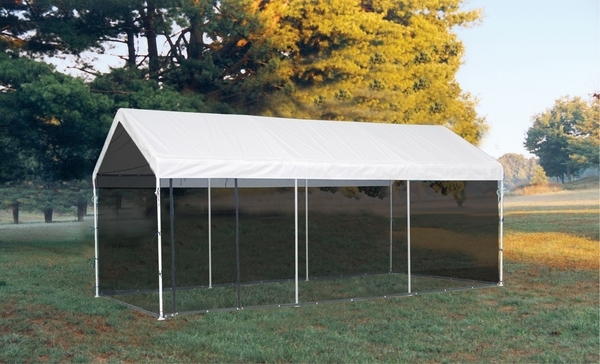 What is the height of the zipper door of this ShelterLogic 10x20 leg canopy and screen kit? The height of the zipper door is 6', located on the side. I was wondering, can you tell me how strong the screen is with this product? I was thinking of using it to keep chickens in and the predators out. It would not be suitable for that use as the screen can be easily torn by predators. I bought this product because of its reviews. I am somewhat satisfied with the shelter itself but the screening is a different story. It is very cheaply made and will not last the 10 years they say it will. It is also not meant for cars like they told me it was. I live in the desert where it is 125 in the summer time and the last thing i want to be doing is having someone hold it open so i can drive my car in. They do not provide you with the anchoring supplies that you need, all you get is 8 "tent stakes" and a little breeze just ripped them right out of the ground. If you are going to buy this shelter i would recommend digging holes like i did and putting a bucket of cement for anchoring. Excellent product . Easy assembly and shipped on time . We have had three days of wind and rain and despite the trees that blew over in the neighborhood my car canopy held up great . This product was easy to put up, all parts included, looks great!! ProsThe ease of installing, the quality of materials, no parts were missing.